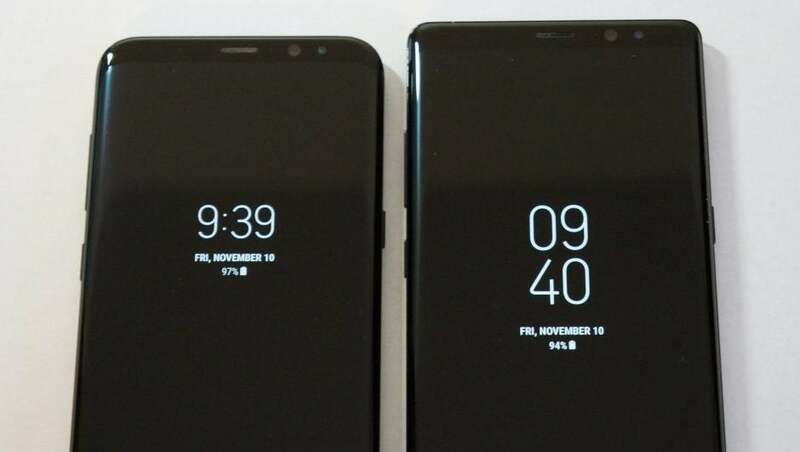 Galaxy Note 8 after one month: Premium phone with a premium price. The Galaxy Note 8 is simultaneously the best and most expensive phone I’ve ever owned. Would I recommend it? Absolutely. The S8+ is top notch as well but doesn’t quite keep up with the Note 8, despite the fact that the battery is larger and the screen is almost the same size. I’m going to avoid quoting manufacturer specifications and focus more on the user experience of daily driving both phones for an extended period of time. The fit and finish is second to none on both of these phones. The glass back, curved glass front and almost no bezels and makes these phones effectually a thin glass slate. It feels like you’re holding a very solid display. They’re weighty and very solid. I even noticed that when they’re out of their cases and lying on the table and you accidentally bump them together, they sound like two billiard balls. On the downside, all of this premium glassy wonder came with an aggressive anxiety regarding dropping them. Both of them are too thin in my opinion. My hand tends to cramp a little if I’ve been holding the slick, thin body without a case for an extended period of time, such as watching a movie. I would love it if they were thicker and had more battery but will solve two problems at once by using a TPU sleeve: less anxiety about dropping and slightly more comfortable for long sessions of media consumption. 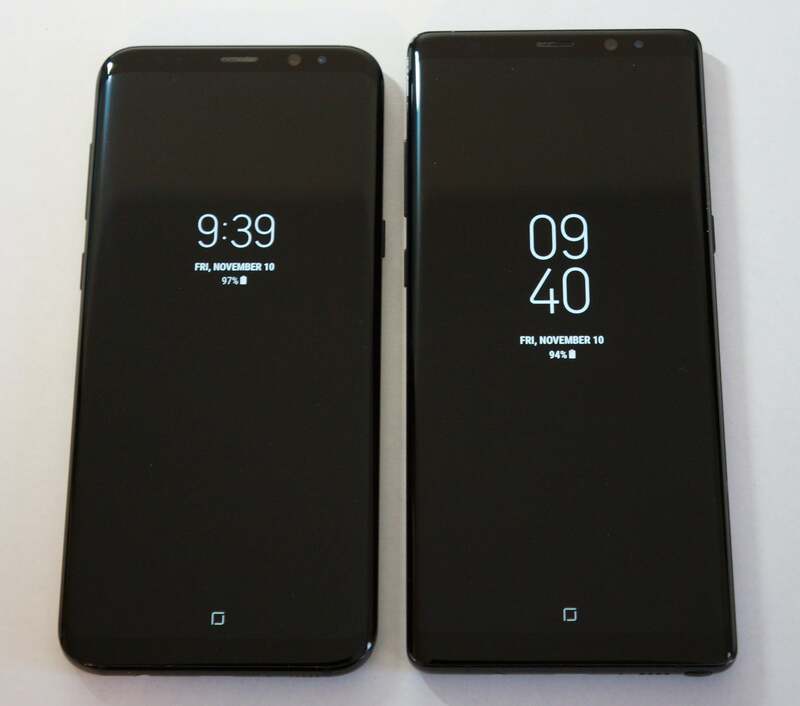 The Note 8 and S8+ sizes are extremely similar. The Note is only a few millimeters larger. Why buy this instead of the 6.2-inch Galaxy S8+? The extra tenth of an inch feels insignificant, but the pros on the Note’s side aren’t screen size or even aesthetics. The continued lack of physical buttons on either phone is a major plus for me. I have avoided Samsung since the S4 until they removed the physical button. The S4 felt plasticky and creaky and the button got particulates behind it and felt crunchy. There is nothing even remotely similar to that on these phones, they’re rock solid. The Qualcomm Snapdragon 835 chipset in the Note is blazingly fast, I can’t slow the thing down even when I try. It’s been bulletproof so far. This is the UX that I’ve wanted for a long time. It feels faster than the S8+, though I haven’t benchmarked either phone. I don’t typically benchmark my phones as I’m less interested in the actual numbers and more interested in what the phone is like to daily drive. The Note 8 has not only one of Samsung’s best cameras, it has two. There are now dual cameras on the back, a first for a Samsung flagship smartphone. It takes brilliant portrait photos, and you can even edit the depth of field post-capture. It feels revolutionary, even though I am decidedly not a camera nerd. The S8+ really does take very nice photographs but the Note really seems intent on producing the best photography possible. Battery life between the two seems pretty equal, even though the S8+ has a slightly larger battery. I’m not completely sure what magic makes that possible, but a giant like Samsung tune these things with intent, especially after the Note 7. I just wish they’d added battery and thickness rather than what I suspect: choosing a target run-time or screen-on-time and going with whatever makes that happen. Even though I would love to see more battery I will mention that the battery life on these things is substantially better than the Nexus 5s that I was coming from. At $929, the Note 8 is one of the most expensive phones you can buy, and the S8+ isn’t far behind at $850. The Note 8 lives up to its price and the S8+ isn’t far behind. They’re both beautiful but the Note has a bit more guts. Wireless charging has been in my sphere of awareness since the Nexus 4, and as usual, is amazing. The stylus on the Note is fun, but not sure what I can use it for personally. To be fair, I’m not a big fan of styli (styluses?) to begin with, and I wouldn’t buy the Note for that.